The harmless postage-stamp sized pink slide, placed on the desk of Professor Amy Shen was though little but embedded with potential to address a range of applications from screening food quality to diagnosing diseases. Made of nanoplasmonic material, this scientific breakthrough has a coating of millions of gold nanostructures having a size of few billionths of a square meter. But why is this material so interesting to the scientific community? In simple words, plasmonic materials possess some unique properties that absorb and scatters light in such a way that makes it desired for its sensing qualities. With possible applications in biosensing, data storage, light generation and solar cells this material is one of 'the' hotshot fields for physicists, chemists, biologists and material scientists alike. 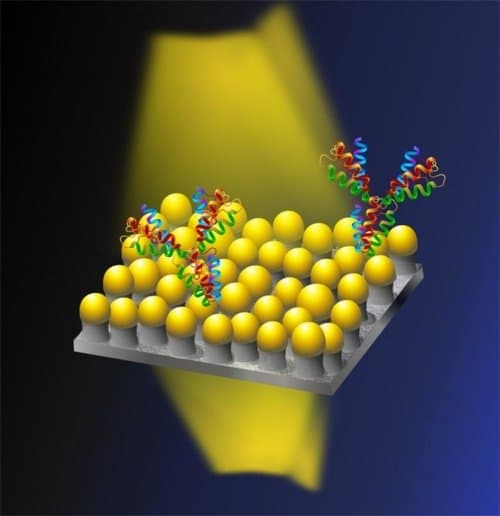 In a recent study, Professor Shen and his peers at the Micro/Bio/Nanofluidics Unit at the Okinawa Institute of Science and Technology has developed a new sensing equipment for studying processes in living cells using the distinctive behavior of the plasmonic material. According to Prof. Shen, one of the major goals that can be achieved via the nanoplasmonic material is a real-time study of processes in living cells. However, making of a suitable (nanoplasmonic) plate on which cells survive for a long enough period but do not interact with the material itself is tough. Challenged by this limit, the team has created a biosensing material that not only keeps the cells alive and working for as long as 7 days but also accurately determines cell proliferation, one of the most important properties associated with cell growth and division. As Nikhil Bhalla, a postdoctoral researcher at OIST and first author of the paper explained, the novel material is highly sensitive and can detect a jump from 16 to 1000 cells. Apparently, these mini instruments look like a glass material but have a surface full of nanomushrooms (nanoplasmonic material with mushrooms like structures) - with stems made of silicon dioxide and caps made of gold. These sensitive nanomushroom caps work as an optical antenna which when interacts with white light absorbs and scatters the light, tinkering some its properties. And these properties of absorbance and scattering depend on the size, shape, and material of the nanoplasmonic materials and also they get affected by other mediums such as the cells which are placed in a very close proximity with the material. Once the light hits the other side of the slide, the researchers can keep a tab of the continuing processes in the slide. The team also adds that unlike conventional methods where dyes are used to check on the growth of cells, the material can detect them directly. The underlying method used in this process was a creation of the same unit OIST, published in the journal ACS Applied Materials and Interfaces in December 2017. Producing large-scale nanoplasmonic materials is also challenging since uniformity across the surface of the entire material has to be maintained. This limitation was also addressed by the team by introducing a new novel printing technique, using which one million mushroom-like structures were created on a 2.5cm x 7.5cm silicon dioxide substrate. As Shivani Sathish, a Ph.D. student of the OIST explains, the technique used here is similar to a stamp in which in which the ink used is made from biological molecules. With an eager note, Professor Shen has mentioned that in future the field has a prospective growth in emerging technologies, for example, wireless systems in microfluidic devices, where users can take the data remotely avoiding the risk of contamination. The research has been published in the journal Advanced Biosystems.